With a new Computing curriculum ready for England, and other countries exploring their ICT curriculum, a really useful assessment/progression resource has been produced by Computing at School. The purpose of the Progression Pathways Assessment Framework is to support teachers in assessing their pupils’ progress in computing from Age 5 (Year 1 in England) through to pupils in secondary school, aged 14 (Year 9). The progression statements in the Assessment Framework have been created based on the 2014 National Curriculum for Computing points of study, which school in England will be required to follow. It has also been aligned to the CAS Primary Guidance document. The column headings are aligned to the different strands of computing found in the Computing at Schools curriculum, which may be updated in the future, and if it is, it will provide guidance for teachers to help them accurately interpret the National Curriculum. The progression through each strand of computing is broken down into rows. The rows are colour coded (like karate belts) to help the teacher to assess whether students are showing competence at different levels and recognise achievement or attainment. Schools can choose to assign arbitrary values (levels) to the coloured rows if they would like to use them with existing reporting systems. The focus of this assessment framework is a progression through and across the strands of computing. If you plan to use this assessment framework with your existing assessment/reporting system then you can agree the benchmark ‘level’ for the pupils entering a particular key stage and assign the arbitrary benchmark value (level) to the appropriate progression statements for each strand. If your school uses a system to set targets for Computing based on performance in other subjects then the flexibility of the Progression Pathways grid allows you to adjust the values (levels) you choose to assign to the coloured rows. Primary teachers focus on the badge statements from the Pink to Blue row. You may decide that pupils entering a particular year group or key stage have prior learning to suggest that they are on the yellow and orange rows for the various strands shown in the grid. If this is the case then you would start your teaching at the appropriate level and assign the arbitrary assessment/reporting values accordingly. There is a PDF document available for download that explains how the Progression Pathways Assessment Framework can used with Digital Badges. Written by Mark Dorling and Matthew Walker for Computing at School, this document maps the computer science, information technology and digital literacy strands of the National Curriculum Computing Programme of Study. Each of the progression pathway statements is underpinned by one or more learning outcomes, providing greater detail of what should be taught to achieve each progression pathway statement and National Curriculum point of study. 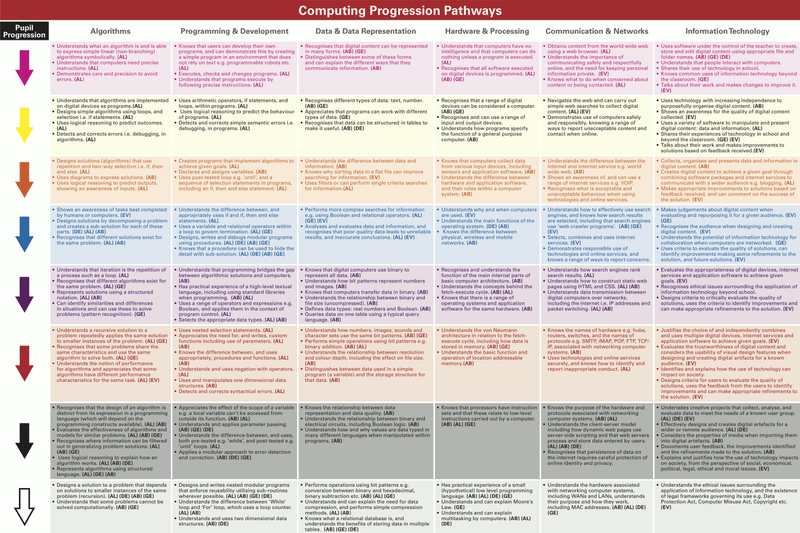 We collaborated with CAS Master Teachers to produce a series of Progression Pathways frameworks for the new National Curriculum in Computing, designed to support teachers in assessing their pupils’ progress across the key stages. The Pathways are mapped to the National Curriculum Programme of Study with a view to helping develop students’ computational thinking and practical skills, and supporting teachers in delivering and measuring meaningful assessment outcomes.